Update: I think Virtual PC is gone. Their web page seems to be a parking page now. That's OK, there are plenty of other products to choose from. See the Virtualization Index for much more. www.connectix.com (link dead, sorry) Virtual PC for Windows, Mac (OS 9 or X) and OS/2 creates virtual machines that can run multiple Windows versions. This is particularly advantageous for Mac users, but even ordinary PC users can find value in this. It's easy to have Linux, Windows 98, Windows ME, 2000, XP Home and XP professional all on the same machine. Easy doesn't necessarily mean fast. It took two hours to install Linux on my iBook, and after installation, running "makewhatis" took 13 minutes. A "time dd if=/dev/hda2 count=1024k of=/dev/null", which would have run in perhaps 18 seconds on a real install, took 24 seconds here. None of that is awful, but it is noticeable. Part of the problem is that the iBook isn't exactly high performance to start with, and the limited memory available (640 MB) does not help. If you are going to run Virtual PC, load up your machine with as much memory as you can. XP runs horribly slow, it's quite painful to use, and seems to have gotten worse after upgrading to Panther. For Windows OS installs, the easiest choice is to buy an OS Pack. This gives you a legal, licensed version of whatever operating system(s) you want, and it is very easy to install. I installed Windows XP Professional from a Connectix OS Pack and had absolutely no difficulties. The installation of RedHat 8.0 was not so easy. Virtual PC enables you to play poker on your mac as well. You begin by creating a virtual drive and allocating memory. I gave it a 15 GB hard drive (potential) and 128 MB of memory. 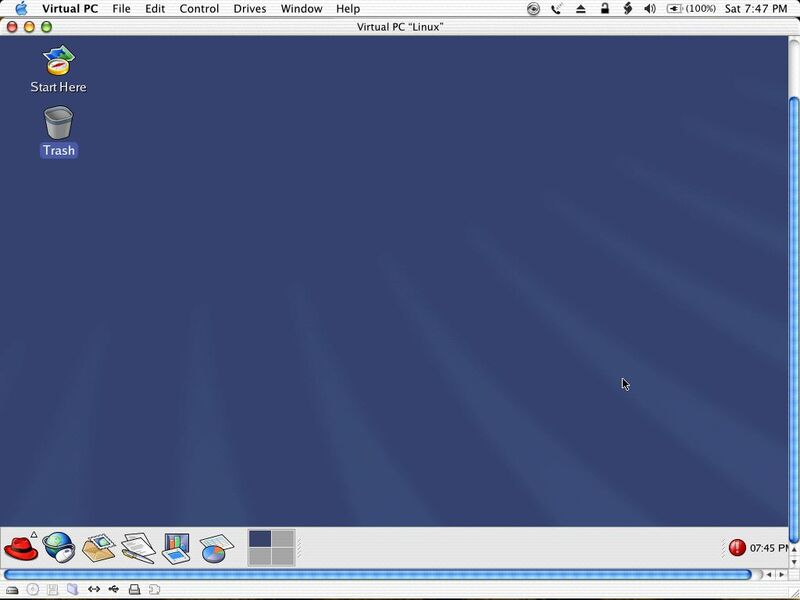 You then simply pop in your install CD and startup the virtual machine. You can also do this using CD images: start up the machine, and of course it will fail. Now drag a CD image to the little CD icon at the bottom of the window, and use the Control menu to send Control-Alt-Delete. The first problem I had was caused by my lack of patience. The difficulty was simply that I needed to wait for the Mac Desktop to mount the CD before telling Virtual PC to start up the installation. My impatience showed up again on CD 2 in a later install; if your install refuses to recognize a CD, try ejecting it and reinserting. After getting by that, my impatience caught me again at the screen shown above. The installation hangs for a LONG time there; I assumed something was wrong and rebooted Virtual PC. Fortunately, when it hung again I had to take a fairly long phone call. That kept my hands off the keyboard, and after ten minutes or so the install continued. If I had paid attention to the activity indicators at the bottom of the Virtual PC window, I would have realized that it wasn't dead at all. 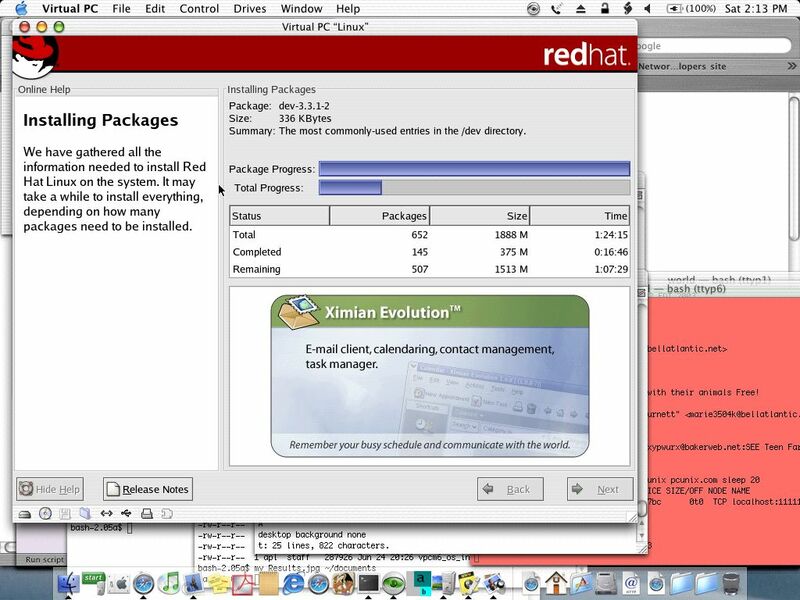 The final problem with RedHat was the GUI configuration. You can just accept the defaults here; I used Unprobed Monitor with a horizontal sync of 31.5-48.5kHz and a vertical sync of 50-70Hz, and a screen resolution of High Color (16 bit), 1024x768. When I clicked "Test Setting", everything went well until it returned to the installation. I had a much smaller window and it would not resize. I'm quite sure I could have tabbed my way to proper answers, and I did try, but I kept getting stuck in the same place so finally I gave up and started over. This time I did NOT test the settings, and the the only concession I made to the possiblility of it not working was to have the login be character based. The RedHat install suffers from another problem: the mouse gets stuck in the Virtual PC Window. The Windows XP I purchased from them has a custom mouse driver that eliminates this problem (except briefly at startup), but here we have to live with it. Use Apple-Tab to switch away. At one time Virtual PC sold a bundled RedHat OS that might have not had this or other problems, but they stopped doing that, and now that Microsoft has bought them, I doubt we'll see it again. The Linux AlT-Screens work as they should: hold down Control and Alt (Option) then fn (the key to the left of Control on my iBook) and press a function key. As mentioned aboove, the performance is a little sluggish at times. Connectix has a .lot of good help on the Windows OS side; for example http://www.connectix.com/downloadcenter/pdf/OptimizingWinXPProandHome.pdf . I don't spend a lot of time in XP or Linux; my main use is to check out how to do something for a client or test scripts I'm writing. The small performance penalty doesn't really bother me. I mentioned above that I had the RedHat drive have a potential of 15 GB. Its actual size is about 5 MB; it will grows as needed. That's an area where you could imporove performance by preallocating the space you really need. There are two ways to handle networking: you can either use Shared Networking (meaning it shares your machines ip address) with the machine set to DHCP, or you can have it set to "Virtual Switch" and assign your own real ip address (or use a real DHCP server). I used the Shared method on both XP and Windows but ran into a very odd problem on the Linux side. I could ping anything by ip address, ssh to any ip address etc. I could also resolve host names with dig or host. Yet I couldn't ping or ssh by host name. That's beyond strange, and I've yet to figure out how that can be. However, for my use, it is unimportant. The very best thing about Virtual PC is its handling of drive changes Whenever you shutdown an OS (using the Virtual PC menus), you are asked what to do with hard drive changes: discard, carry them forward, or make them permanent. When I'm about to try something odd, this feature can be a lifesaver: I save the PC's state first, then do whatever awful thing it is I want to do. If I then get crashes or unpleasant behavior, I simply discard the changes and I'm back to a working configuration. This is just wonderful for people who have to screw around with all kinds of strange software that can do damage to your system. It's also a clean sweep of anything you don't want: you don't have to trust their uninstaller. Gorge Panfone- A very interesting review, I have never seen any screenshot's of Linux running in OS X. I wouldn't suggest doing such a thing, because of Xdarwin/X11 which are X11 servers in themselves, so you can use X11 programs on top of OS X programs with little performance penalty from an actual PPC Linux box, just my thought, anyway great review! Sure. But the point of Linux under VPC isn't to run X11 programs because as you note I can do that with the Mac alone. It's the ability to actually run RedHat in a virtual machine that I use it for - and also because I can break things and fix them just by discarding any changes. I had the same network problem (no DNS) with the Windows XP that shipped with Virtual PC but only in the shared IP address scenario. If I gave it a seperate IP address everything works fine. Cannot get ibook G4 network to work with SUSE 9 what did you use as your driver in the Redhat install? Nothing in particular - just a straight, default install. But since upgrading to Panther, VPC has become unusable - too slow for me, so I took it all off. Did you go to the latest VPC? I found things unusable until i upgraded. It's still slow, but as you note, being able to revert to old configurations has saved me from complete installs. I like the idea of running OS X as my main operating system with Linux and Windows virtualized (that is, if I could afford a dual-G5), but you still have to patch each OS to keep it all relatively safe. The only protection for VPC systems OS X offers, that I know of, is NAT by default, which I get anyhow at home from my Linksys cable/DSL router. Otherwise OS X and all hosted operating systems still need to be maintained and updated independently. Saves on hardware costs if you must test or run multiple systems, not necessarily on software maintenance. I certainly agree. The advantage is simply convenience; having all my OSes on one box would be very nice for disconnected work, for cutting and pasting between them, etc.